James S.H., Kish, P.E. & Sutton, T.P. (2005). 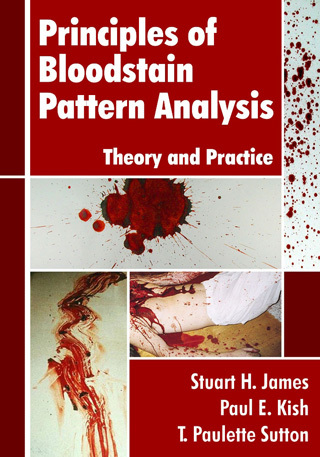 Principles of Bloodstain Pattern Analysis Theory and Practice, Boca Raton, Florida: Taylor & Francis Group, CRC Press Inc.
“Principles of Bloodstain Pattern Analysis: Theory and Practice presents an in-depth investigation of this important subject matter. A multidisciplinary approach is presented throughout the book that uses scene and laboratory examinations in conjunction with pathology, forensic serology, and chemical enhancement techniques. Emphasis is on a thought process based on taxonomic classification of bloodstains that takes into account their physical characteristics of size, shape, and distribution, and the specific mechanisms that produced them. Individual chapters analyze case studies, with two chapters specifically discussing the details of legal issues as they pertain to bloodstain pattern analysis. Information highlighted throughout the book includes an examination of bloodstained clothing and footwear, the essentials of bloodstain photography, and information on bloodstain pattern analysis for crime scene reconstruction. Dramatic color images of bloodletting injuries, bloodstains, and crime scenes are also presented to complement the technical content of this resource. Written by authors with many years of experience in the field, and features chapters contributed by qualified and respected forensic scientist and attorneys.